August is high season for antique shows and auctions in New England: generally featuring Americana items with global goods mixed in, as our Yankee forebears, particularly those who dwelled in regional seaports like Salem and Portsmouth, were very worldly, of course, and lived with things that came from other parts of the world. A decade or so ago I was in full-court hunting mode during this season; now I’m an armchair/laptop peruser, although next weekend’s sale at Northeast Auctions looks so good I’m certainly going to attend a preview, at the very least. Such interesting wares! All my picks are from the two (or one long) auctions which will be held on August 18-19: the “Lifelong Collection of Susan MacKay and Peter Field” on Saturday with a general auction following, into the next day. There is no rhyme or reason to these selections: they just caught my fancy. American Terrestrial Pocket Globe made in Wethersfield, CT, c. 1850. A pocket globe is surely better than a pocket atlas. English Stumpwork Profile Portrait of King Charles I of England, 1646. How amazing is this—and there are more seventeenth-century lots in the MacKay/Field collection as well, including two more representations of King Charles I during the Civil War, or perhaps even after his execution! Royalist relics–from either side of the Atlantic. Silk Needlework Picture of a Gentleman wearing a Tricorn Hat, c. 1770. I like this guy from the next century too. English William and Mary Japanned Pine and Hardwood Highboy. I do not have a highboy, or a William and Mary piece, and I would really like both: this doesn’t really suit my present house but who knows where we might end up? I like the subtle Japanning and it has a very low estimate! Set of Eight American Sheraton Fancy Red Painted and Decorated Side Chairs. Do I need chairs? No, absolutely not. But these are RED fancy chairs. Hard to resist. Andre’s Journal: an Authentic Record of the Movements and Engagements of the British Army in America from June 1777 to November 1778 as recorded from day to day by Major John Andre,” Edited by Henry Cabot Lodge, Boston: The Bibliophile Society, 1903. This is a beautiful two-volume book which was limited to 487 copies for Bibliophile Society members: I continue to be fascinated by how fascinated Americans were (are?) with Major Andre! Lady Liberty Standing on the Head of Great Britain underneath the Great Seal of the United States, American School, War of 1812. LOTS of War of 1812 items in this auction: this is my favorite. 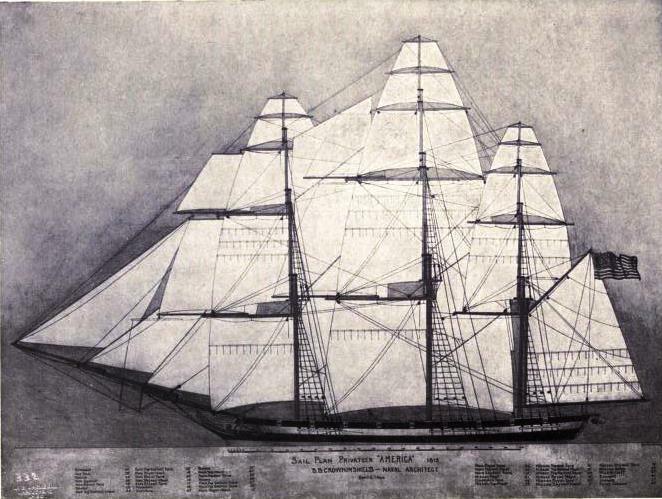 The Frigate “Arbella” of Salem. American School, early 19th Century. I guess I have to have a Salem item–this is a lovely ink & watercolor painting of a ship with which I am not familiar: the original Arbella brough John Winthrop to Salem in 1630, but I don’t know anything about this Arbella. Only the Phillips Library can tell us, I’m sure! The Young Sailor. American School, 4th quarter, 19th century, Mrs. Mary Ide Spencer/Artist. I just love this painting: I know it would make me happy every day if it were mine. The evening before last I was incredibly privileged to be able to attend a gathering in a ship’s cabin at the top of the Hawthorne Hotel. Not an actual cabin of course, but a rather convincing model, built for the Salem Marine Society in the 1920s as a condition of the sale of their building to the developers of the hotel. The Society, which was founded in 1766, had met continually at this location since 1830, and while its members do not seem to have been particularly attached to their Italianate Franklin Building (which replaced the earlier McIntire Archer Block, destroyed by fire in 1860), they were very attached to the site. And so the new hotel opened in 1925 featuring not only six stories and the latest accouterments, but also a rooftop cabin room, inspired by the actual captain’s cabin of one of the last great Salem East Indiamen, the barque Taria Topan. This cabin in the sky also represents the fruitful collaboration between the barque’s one-time commander, Captain Edward Trumbull, and the architect of the Hawthorne, Philip Horton Smith. It remains the private meeting room of the Salem Marine Society and their occasional guests, of which I was fortunate to be one. Nathaniel Bowditch presides over the Salem Marine Society’s cabin at the top of the Hawthorne Hotel, the evolution of construction on the spot, from Samuel McIntire’s Archer Block (completed by 1810) to the Franklin Building (built after 1860) to the Hawthorne Hotel (built in 1925); X marks the spot of the rooftop cabin. I was so excited to be in this space that I was a bit frenzied and not very good company, I’m afraid. I just wanted to see and capture everything. My skittishness was compounded by the fact that it was an absolutely beautiful early evening, and the ship’s cabin opens up onto an equally enticing (on such a day) ship’s deck, affording amazing views of Salem in every direction. Up in the air, surrounded by water on three sides, Salem’s original maritime orientation is all too apparent: the next time someone complains to me about how inaccessible is, I’m going to tell them to take a boat. But all those dashing sea captains were back inside, hanging from the teak-paneled walls in the form of portraits (alongside navigational instruments and paintings of ships) and encased in the Society’s registry of masters, a vast compendium of faces from 1766 to the present. I could have spent hours with this volume, gazing at all these drawings, paintings, silhouettes, and photographs of men and (finally!) women. There are so many ways you could use this source: it’s not just a record of maritime history, but also genealogy, social history, military history, even fashion history. Hats, no hats, hats, no hats. Captains Abbot, Fiske, Chipman, Millet, Ward (clockwise), Tucker (right) and Webb, masters and members of the Salem Marine Society; a 20th century portrait of Captain John Fillebrown, who served in the War of 1812 and died a prisoner of war at Dartmoor Prison in England, along with 270 other Americans. There were stories to be found in the cabin as well. The most apparent and dramatic one concerned the status of the Society’s very first honorary member, Matthew Fontaine Maury, Commander in the U.S. Navy and the first superintendent of the U.S. Naval Observatory. Despite his maritime magnificence, Maury was a Virginian and so not eligible for membership in the Society, but its membership honored his achievements by bestowing an honorary membership on him in 1859 and hanging his portrait on the wall of their original rooms.Two years later, after Maury resigned his commission and joined the Confederacy upon the start of the Civil War, the Salem mariners rescinded his membership, condemned him as a traitor, and placed his portrait head down and against the wall. This “reverse orientation” remains to this day, though a visiting delegation of the Mary Washington Branch of the Association for the Preservation of Virginia Antiquities gifted the Society with another image of Commander Maury in 2008, which hangs alongside the reversed portrait. And so now, in the words of the southern Commander, “All is Well”. July was pretty hot; August will likely be cooler, but I still think it’s time to revive an old summer drink here in Salem called switchel. A colonial “ade” made of ginger, vinegar, and a sweetening agent, switchel has enjoyed a revival over the last few years, and is currently being produced in such variant hipster havens as Vermont and Brooklyn. In older texts, it’s often referred to as “haymaker’s punch”, implying agrarian origins, but I’ve also found plenty of references to switchel in maritime and military sources. There’s a famous reference to it in the account of one of the major naval battles of the War of 1812, between the USS Constitution and the HMS Guerriere off the coast of Nova Scotia. Anticipating a great victory, the Guerriere Captain James Dacres ordered his cooks to “prepare the switchel” for the soon-to-be captured Americans. After Old Ironsides prevailed, this phrase was incorporated into a mocking/patriotic American sailors’ song: When prisoners we’ve made them, With switchel we will treat them; We’ll welcome them with Yankee Doodle Dandy, O. It’s definitely one of the first American beverages. There’s a very nice reference to Salem switchel in the memoirs of Boston Brahmin Robert C. Winthrop, who marched up to Salem on a hot summer’s day in 1822 in the company of the Boston Light Infantry to camp out on the Common:a wisp of straw for our bed, and a bit of thin bunting above our heads, through which we could see the sentinel stars keeping their watch in the sky, more vigilant than any sentinels we could station, were our only and all-sufficient accommodations; and a little molasses and water and ginger–a switchel I think it was called–was our best drink. Elizabeth Hall’s Practical American Cookery and Domestic Economy (1857) contains the basic recipe (mix half a gallon of molasses, one quart of vinegar, 2 ounces of powdered ginger with five gallons of water, boil and cool to make a beverage that is not only “very pleasant” but also “highly invigorating and healthful”) but it is clearly suitable for all sorts of substitutions and additions: the modern Vermont versions contains maple. Salem is a major foodie town today, with countless restaurants and bars, a distillery, a cider taproom, a brand new beer brewery, beer hall & garden, and a whole bunch of clever and crafty people: surely someone could produce and market a special Salem Switchel drawing on our city’s past and present? A Salem variety should no doubt feature molasses, but I think rum would also be an appropriate (and appealing) ingredient. And I have the perfect containers for inspiration: these are beautiful vintage bottles produced for S.B. Winn & Son, producers of ginger ale and other beverages, and Eldredge’s Lagers, all made in Salem over a century ago. 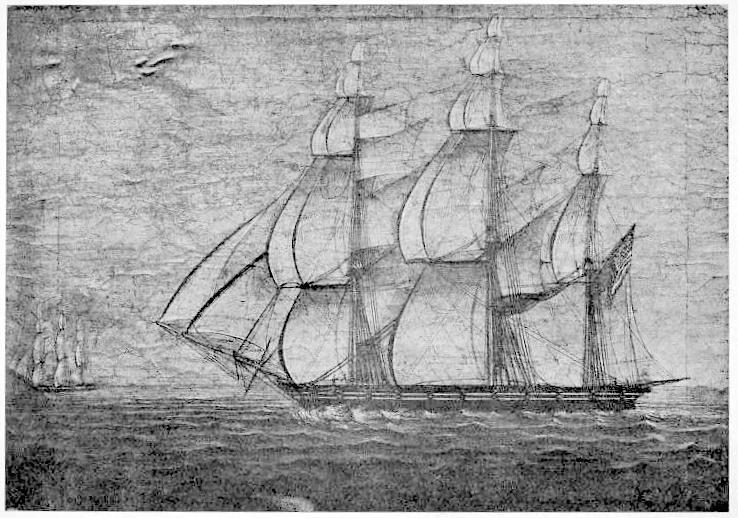 For this evolving-memorial day of sorts, a thoroughly patriotic post on one of Salem’s illustrious ships from days gone by, the aptly-named America, which one source describes as “the largest, the fastest, the most fortunate and the most famous of all the privateers which at any time sailed out of Salem Harbor” (Old-Time Ships of Salem, Essex Institute, 1922). This is saying a lot, as Salem sent out 40 privateers during the War of 1812 alone. 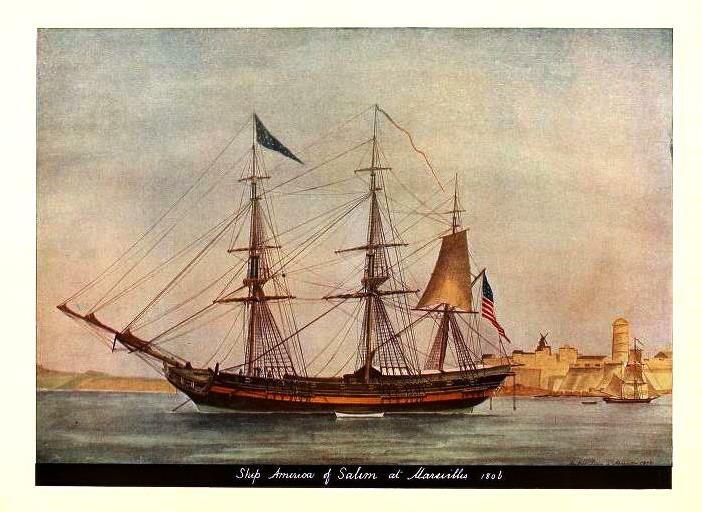 Built as an East Indiaman by famed Salem shipbuilder Retire Becket for Crowninshield & Sons in 1803-4, the America had an illustrious commercial career even before it (she) was transformed into a private-armed corvette for the War of 1812. Its entire voyaging history reads like a novel by C.S. Forester or Patrick O’Brian. Anton Roux, The Ship America at anchor in Marseilles, 1806, Peabody Essex Museum; Model of the America by Captain H. Percy Ashley, Addison Gallery of American Art, Phillips Academy, Andover, Massachusetts. The conversion of the America from merchant to naval vessel involved removing her top deck and lengthening her masts and spars to support an enormous spread of sail–she was fast before by all accounts, but after she was “razeed”, she became even faster, a ship of prey. To me, she looks like she’s very low in the water, but obviously also very light in the water. The America was armed with 20 guns and a crew of 150 sailors for her five war-time “cruises”, during which she captured 27 British vessels, valued at more than a million dollars with their cargoes. 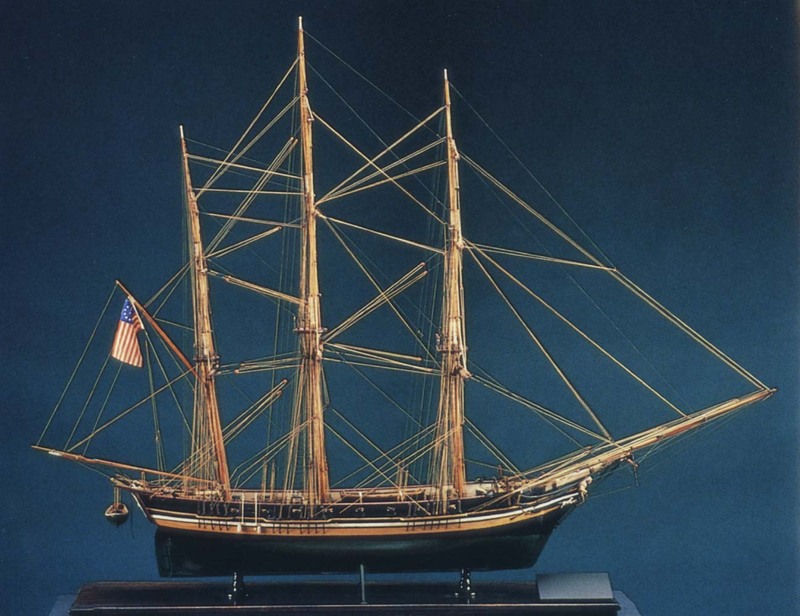 After the war, the America languished in Salem and was finally dismantled in 1831, outlasting the famous luxury yacht modeled after her, George Crowninshield’s Cleopatra’s Barge, by several years. 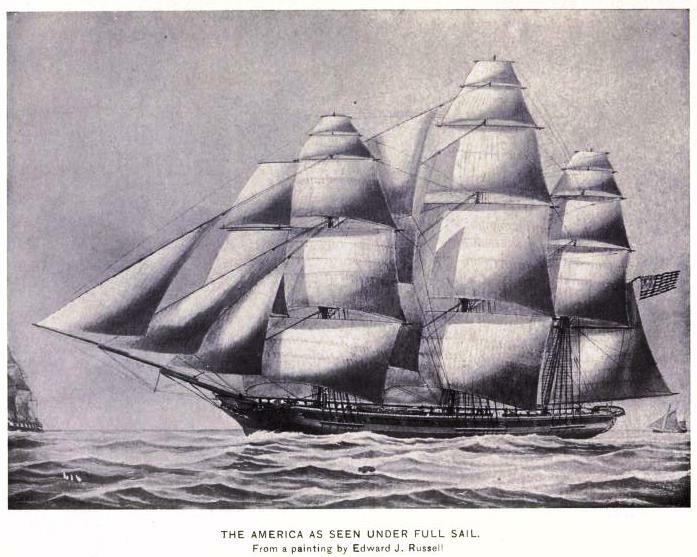 The America under full sail, in a series of illustrations from B.B. Crowninshield’s “Account of the Private Armed Ship ‘America’ of Salem”, Historical Collections of the Essex Institute, January 1901): the first is from a painting by Edward J. Russell, and the last is from a painting by George Ropes of the America chasing down the British Ship ‘Princess Elizabeth’ in 1815, both are in the collection of the Peabody Essex Museum, Salem. I’ve been looking, looking, looking, but I can’t find an America plate or jug (though many Friendship and Grand Turk ones are out there), though I did find the hooked rug below, a lot in Northeast Auctions’ recent Annual Marine, China Trade & Historical Americana auction.